Style. Sophistication. Class and unmistakable, incomparable beauty. You know that your love is the greatest woman in the entire world and you are so lucky to be hers. With the classy, elegant design on this Happy Birthday card, you can give your sweetheart the birthday celebration she deserves. Make this a birthday she will never forget by sending this birthday card today! From the minute you saw your love, you knew that you had met the most beautiful woman in the world. From her smile to the way she treats everyone she meets, her beauty shines from the inside and the outside. 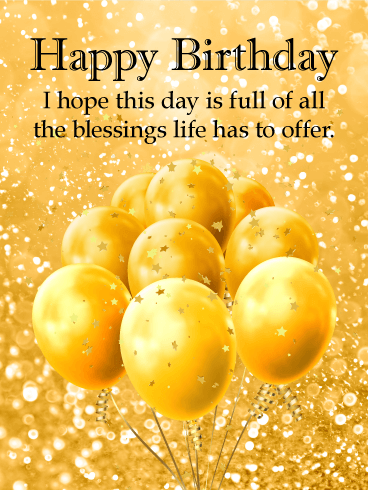 For her special day, send this Happy Birthday card to show her how lovely you think she is and to wish her a day that is just as gorgeous as she is! 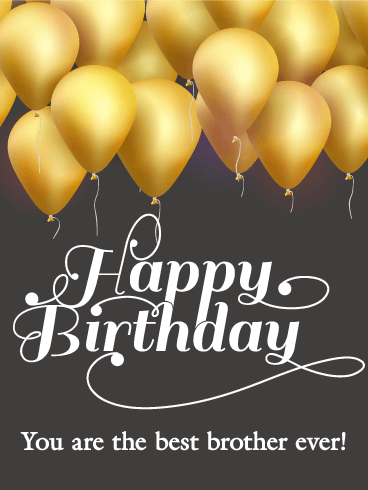 Isn't gold just the perfect color to celebrate an important birthday? It's so exciting and regal! The bundle of balloons and surplus of confetti add such a fun element to the birthday card. The verbiage, wishing someone blessings on their birthday, adds a more serious and sentimental element without being over-the-top. This birthday card is the perfect balance of fun and heartfelt. If you're someone who struggles to find the right words to say, especially on a loved one's birthday, this is the birthday card you've been waiting for. It's simple and sweet with everything you could ever want in a birthday card! Wishing success, health, and good fortune is so thoughtful of you, while the balloons add a whimsical element. This is a great choice for everyone! 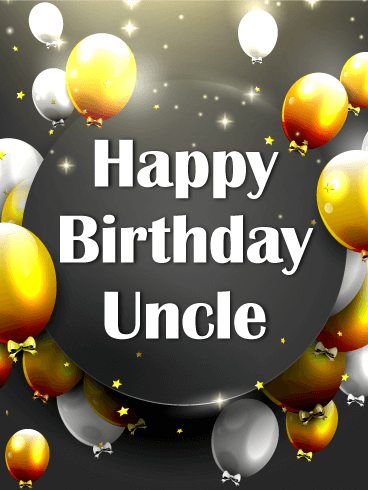 You're thankful for your uncle today and every day, but on his birthday you have the opportunity to tell him about it with this birthday card. 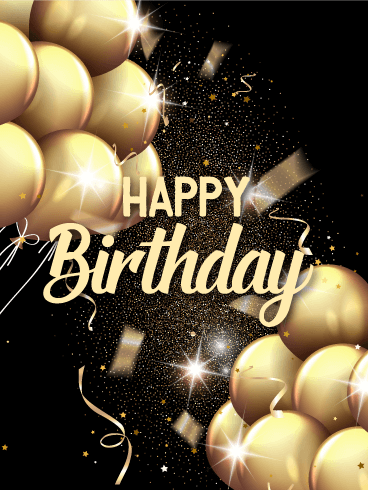 Featuring bundles of gold and silver balloons floating toward the sky and stars on a black background, this birthday card is the perfect way to say you care. Looking for the perfect happy birthday card to dazzle your husband with? You just found it! This happy birthday card was designed with a touch of style and class, and will certainly impress the one you love. It features beautiful golden balloons along with golden glitter that forms spectacular hearts. 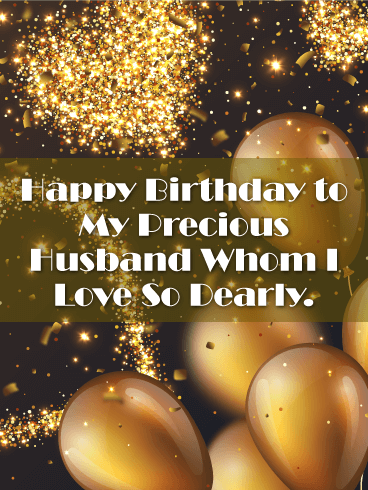 The message that wishes your husband a happy birthday will also tell him how much he is loved. 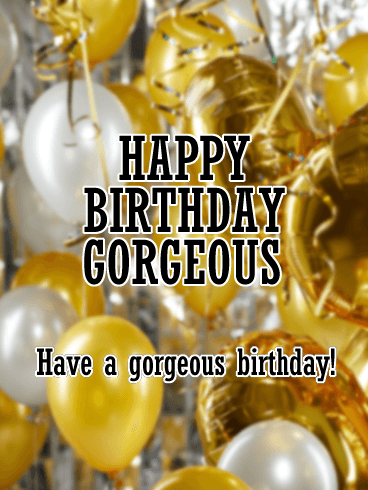 Send this fabulous happy birthday card out today! It's party time! This balloon and confetti-filled card is the perfect celebration for any brother, sister, friend, or colleague. It’s like a party in a card! This is a great option for the party animal in your life, and the bright gold colors add tons of excitement to an already exciting day! Who says black and gold decorations are reserved for New Year's celebrations?! Just take a look at those snazzy colors! This birthday card is a great choice with a unique color scheme that is sure to catch everyone's attention. It's exciting enough to be appreciated, but simple enough that you can customize it based on whomever you are sending it to. Your relationship may not be perfect, but you know you have the best brother ever! To celebrate his birthday this year, send him a Happy Birthday card that is as classy as he is! 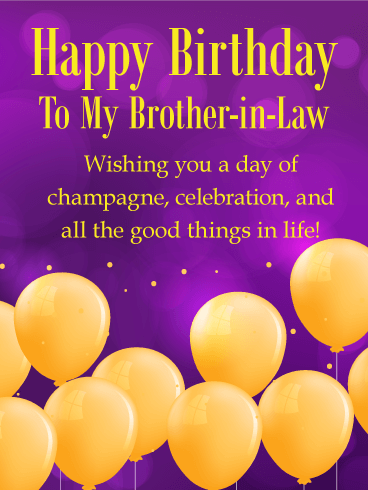 The sophisticated colors and style of this birthday card make it a great option for your adult brother. 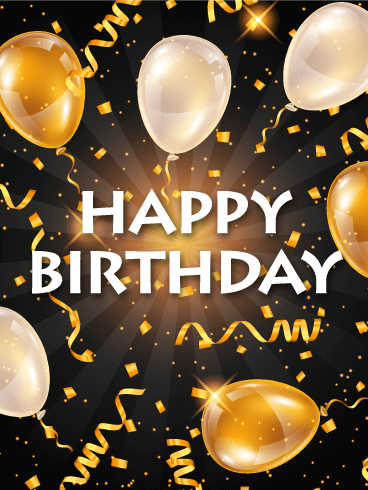 Let him know how great he is and send your birthday wishes with this card today! 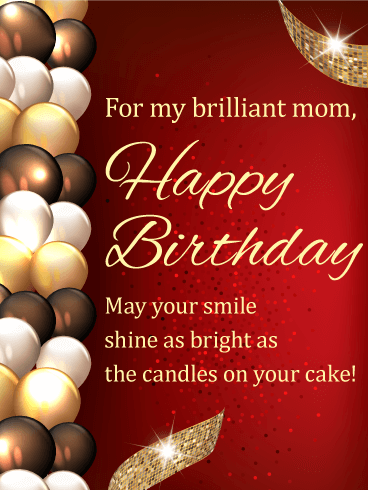 This beautiful birthday card will make every mom feel "brilliant" as she celebrates another year, surrounded by all the people she holds most dear. Shimmering tone of gold stand out against a rich red background. At the center is a heartfelt message: "May your smile shine as bright as the candles on your cake!" It's such a wonderful way to let her know that, whatever she's wishing for, you hope it comes true. What would we do without sisters? They are our best friends and best supporters. 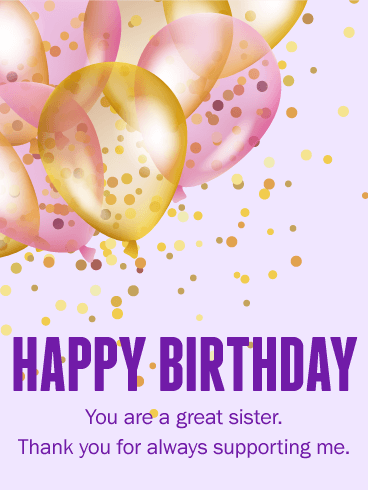 Send some love to your sister on her birthday with this purple and confetti-filled card. A thoughtful birthday message will go a long way in making her day extra-special. The translucent gold and pink balloons are graceful and lovely floating in a cloud of confetti. 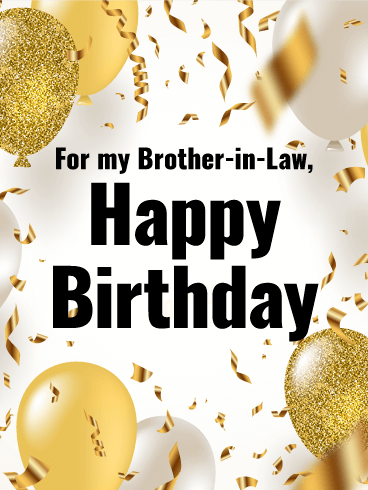 Wish your sister a happy birthday with a unique birthday card today. Do you know a diva who is celebrating their birthday soon? Or maybe a spotlight-loving friend who is a turning a year older? If so, this is the perfect Happy Birthday card to celebrate their special day! 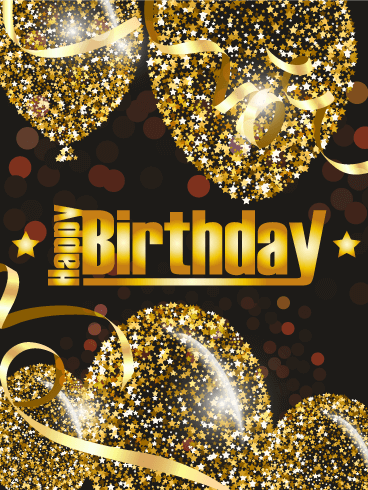 The bright gold text and gold and silver stars that fill this birthday card will make your friend or family member feel like a celebrity on their birthday - the best day to feel like a star! Some people have cool dads, but your dad is definitely the coolest. 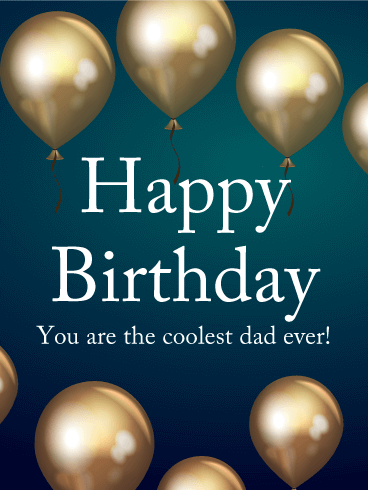 This year, let your dad know just how cool you think he is by sending this fun Happy Birthday card! 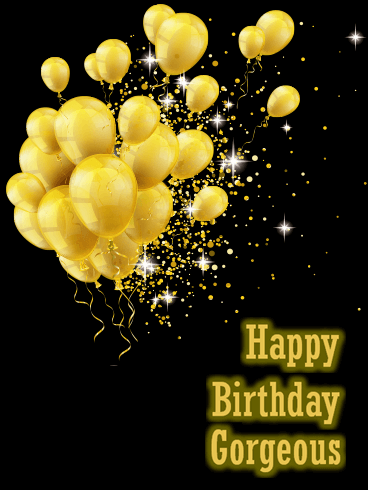 The blue background and shiny gold balloons make this birthday card classy and cool - just like your dad! 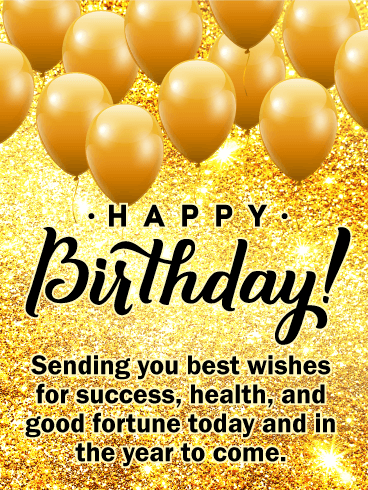 Help him have an amazing day by sending this birthday card today!